As is the case with most European families, Argentine-born sons were often named after their father, so there are actually two David Spinettos buried here. 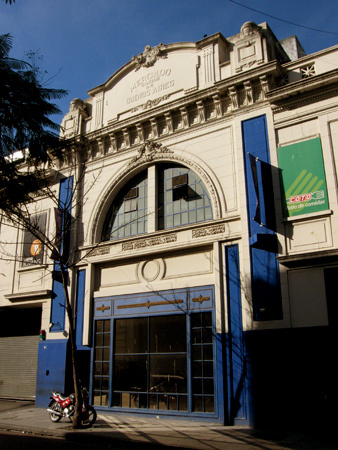 One was born in Genoa, immigrated to Argentina, & opened the first wholesale fruit & vegetable market within the city limits of Buenos Aires in 1898. Located in the center of town, it did a booming business. David’s plaque is on the left. 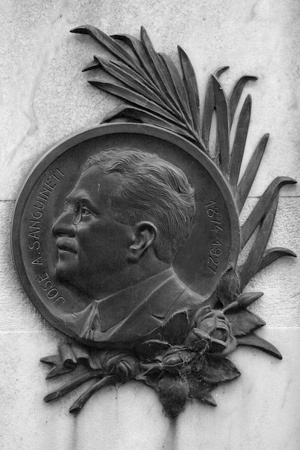 On his death, the Mercado Spinetto was run by his son-in-law, Juan Sanguinetti… seen on the plaque on the right. 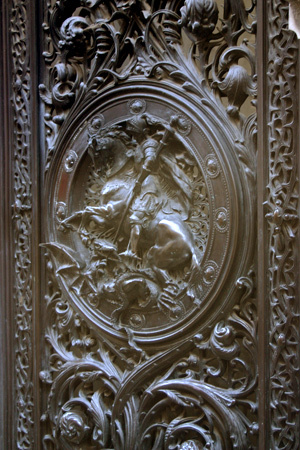 Magnificently Art Nouveau, the crown of thorns has been turned into a decorative frame for St. George killing a dragon—a symbolic representation of the devil. 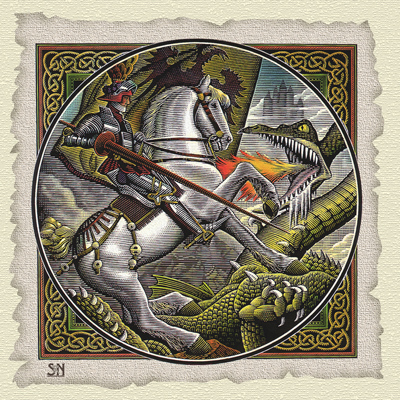 St. George was a Christian soldier, born in Turkey & martyred around the year 300. As one of the patron saints of Genoa where the Spinettos hailed from, they pay a spectacular tribute to their homeland. Hands down, this gets my vote for Best Door in the entire cemetery. The vine design surrounding the exterior cross is repeated inside… although it’s difficult to peek through the small gaps in the St. George door. 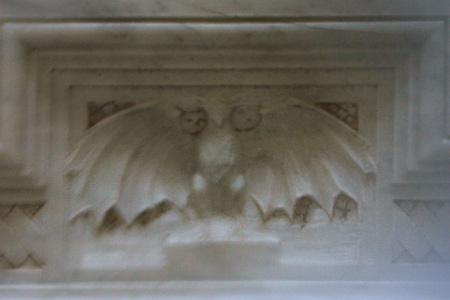 Another Art Nouveau-inspired image visible is a bat just above the altar. 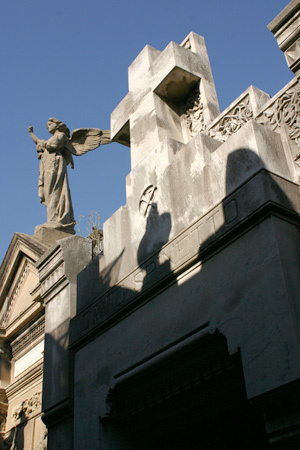 A creature of the night, what better symbol to watch over the residents of a cemetery? Very good review! As the oldest great grandson of David Spinetoo Sr. 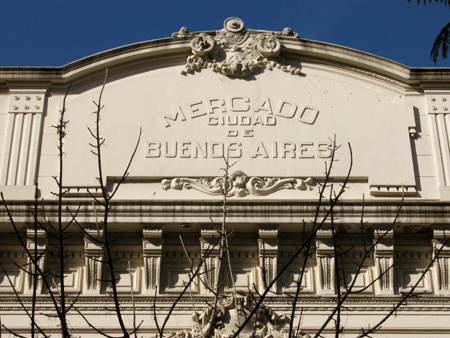 I would like to point out that the Mercado Ciudad de Buenos Airers (Spinetto) was actually founded in 1894. Thank you very much Angel for leaving a comment. Te puedo hacer una consulta?? Nosotros que quieren preservar el patrimonio de la ciudad vamos catalogando la obra de varios arquitectos. Como digo en la nota, hay evidencia que la puerta de la boveda de tu familia fue diseniada por Mario Palanti. Uds por casualidad tienen algo documento familiar que puede comprobar ese dato? Seria de gran ayuda. Un abrazo! Hi Robert! First of all, please excuse my “keyboard” mistakes. I was in a hurry! Yes, I have some letters which I will have tol ook up in my files. I am at present trying to organize them and protecting letters and other family papers in adequate files, etc. It might take a few days, perhaps a week or so to find Palanti’sc correspondence. We were eight, four brothers and four sisters. My brother Jorge passed away in 2001 at the age of 55. As you can well understand, in large families, papers, files, complete libraries,end up scattered and most times wasted. While this is not exactly our case, I do not know how careful my other brothers and sisters have been in keeping such material. I remember my grandfather David J. Spinetto had a unique book on Mario Palanti’s works and sketches, dedicated to him in longhand by Palanti himself. But I lost track of that book. Some years ago, I bought a book on Palanti with fabulous photographs, excelent binding and in premium shape. 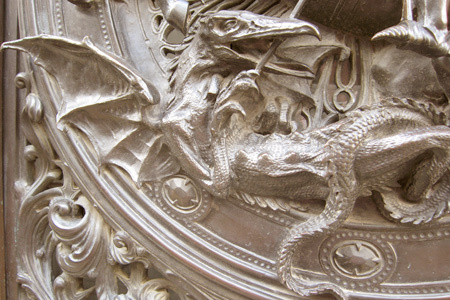 Therein is a full page picture of the vault’s door. I seem to remember that Palanti´s relationship with my grandfather became more distant as the architect became closer and closer to Mussolini and his regime. Luckily my grandfather was a bitter anti fascist, to the point of refusing a decoration from the Italian Govt. in the twenties, because the decree was not signed by the king but by Mussolini. The Italian Republic, retributed this gesture by decorating him with the Ordine al Merito della Repubblica Italiana as Ufficiale on June 2nd, 1960. This diploma and decoration is in my posession. Please feel free to contact me on whatever matter you may need on this subject or other related to my family or other major Italian names.With best personal regards, Angel David Pini Spinetto. Supongo que con tantas representaciones de esa escena mítica, Palanti eligió una así para usar en la puerta. Bueno, es mi hipótesis. Dudo que la familia sepa algo al respeto pero si encuentro el mail de Ángel, le pregunto. 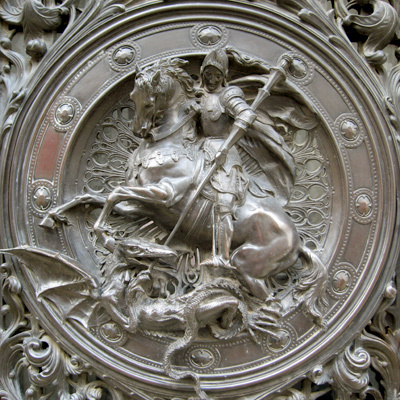 San Jorge es uno de los tantos santos patrones de Génova. Fijáte en Wikipedia… los genoveses, con su flota mercantil, son responsables de tanta difusión del santo en Europa. Saludos! cómo puedo contactarlo para hacerle una entrevista? Hola, necesito contactarme con Ángel David Spinetto Pini para hacerle una nota, sobre David Spinetto, muchas gracias! Hi Angel, as a fellow descendant of David Spinetto and family, I would love to get in contact with you. 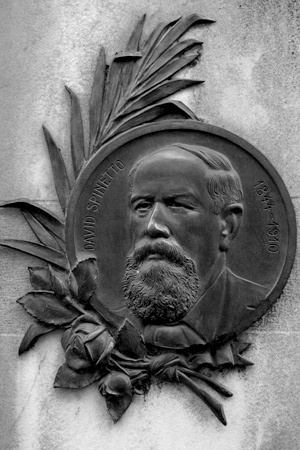 I’m doing a large genealogy project and am trying to connect my great-great grandfather, Esteban Spinetto, who immigrated to Bs As in 1849 from Genoa to your David. I am struggling to determine if they were brothers, nephews, or something else. Please let me know if there’s a way I could get in contact with you! 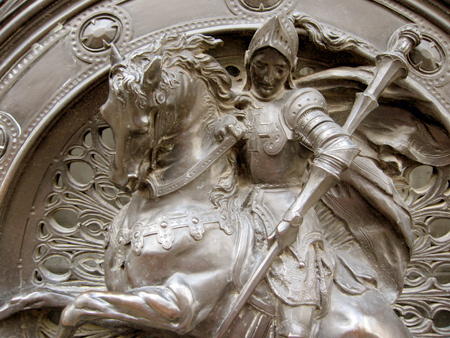 Hi Angel, I would like to contact you to have more info on Mario Palanti and on the image of S.George’s door. 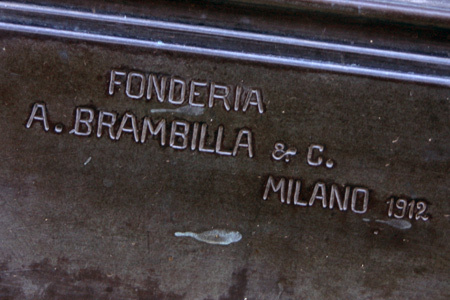 My name is Carlo and I’m researching connections between Mario Palanti and an Italian sculptor that already worked with his brother.